Why is 99designs Called 99designs? When I was fourteen years old, I didn’t have too many serious worries on my mind. Shocking, right? I cared about playing sports, dunkin’ Dunkaroos and winning running races at the park. However, not all fourteen year old brains are wired alike. Some, or at least one, had aspirations of building an online business. Since then, he has gone on to build four successful brands, advises a handful of tech startups and was named to Inc.s “30 under 30” list. His name is Matt Mickiewicz. In the form, graphic designers were playing a game called Photoshop Tennis. Typically, a match is played between two designers. The first player serves an image and the receiving player modifies it before sending it back. The process goes back and fourth until a predetermined number of rounds have elapsed or the player’s choose to end the game. Often, but not always, an independent judge will declare who played the best shots and deem the winner. Until one day, when a member of the form recognized this behavior and requested help, asking the community to submit their designs and he’d pay the winner for the design he selected. And that’s how 99Design’s contest driven, crowdsourced business model was born. The company was spun-out and co-founded by Matt Mickiewicz and Mark Harbottle in Melbourne, Australia in 2008. They shifted markets and setup shop in the United States after realizing over 80% of their traffic came out of it. The company is CEO’d by Patrick Llewellyn and is headquartered in San Francisco, with offices in Melbourne, Berlin, Paris, London and Rio de Janeiro. To date, the company has raised over $45 million in two rounds of funding and has some impressive metrics to showcase their size and engagement. Why is it called 99designs? Just a couple months ago, the 99designs team got a chance to get close and personal with their community. They hosted their very own logo competition requesting help for a new brand identity. “The old logo for me represents that notion of ‘Here we are!’ It captured the flip card approach and the fact that there were multiple designs coming in. What we wanted to achieve with the new logo was something that was really flexible, and to make the site more about the customers who come and get important designs created,” Llewellyn tells TNW. “The new word mark is clean and has an app treatment,” he describes. “Our position in the scheme of things is to be the canvas for everyone else. In our design contest we saw a great range of designs, but what we got to in the end we realized what was important was to continue to simplify who we are and what we stand for. 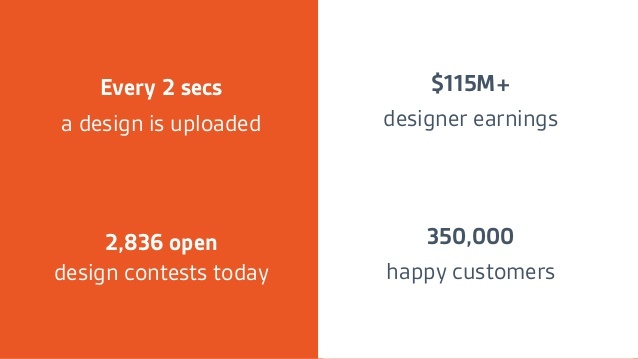 The team received more than 4,000 entries from over 556 designers before selecting the winner” You can locate an assortment of logos they passed on from other designers here. 99designs is more than just shop for logo design, they’ve really evolved into a hub for all things design related. You can crowdsource all sorts of projects like clothing, packaging, banner ads, business cards, infographics, stickers, tattoos and so much more. @AdamTylerLang Private contest so not viewable, but someone once asked for 3D design concepts of a large mechanical dragon. @AdamTylerLang From memory it or something like the original design was actually built and taken to Burning Man.